Children's melamine handled cutlery set with a fun jungle jamboree theme! Get the matching pieces or the fun gift set for a complete bundle. 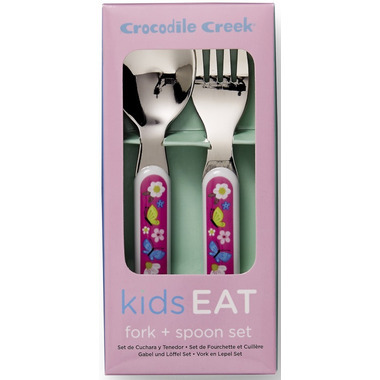 All Crocodile Creek Cutlery Sets are BPA, phthalate, PVC and lead free. They are also dishwasher safe. These utensils were bought for my niece as a baby shower gift. She loves that everything goes together but does not match exactly IE: cup, bowl, plate & bibs. She has the "backyard friends" set. Great cutlery set. The fork is actually functional, sharp enough to pick up food but not too sharp. These have held up well in the dishwasher so far. They're easy for little hands to hold and not too chunky. Works great for my 20m old and almost 4 year old. Best quality kids utensils yet! Perfect for my 2yr old. Love the longer handle than the skip&hop brand. Washes well in the dishwasher too.